The Petzl resin anchors are produced by forging. From a metallurgical viewpoint forging is the best manufacturing process but has a high production cost which is reflected in the retail price. They are inherently robust mechanically and have the advantage of using a relatively small drilled hole. 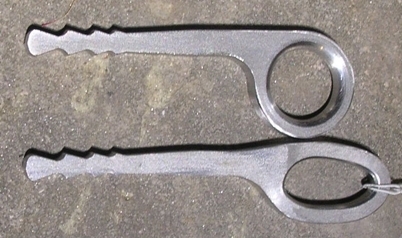 These are two examples of a common design which is made from cold drawn stainless steel rod bent and welded to form an eye. They have the advantage of using a relatively small drilled hole. They have the disadvantage of a weld which has the potential of increasing corrosion susceptibility. The shank is knurled or notched to provide some mechanical bond. Discontinued in 2005 the DMM ECO hanger was the design preferred by the British Caving Association and several thousand of them have been installed in caves. The first of the 'P hangers' the DMM ECO hanger design was far from ideal. It requires a wopping 18mm diameter hole. The two parts of the shank are bent about 20mm from the end in order to increase the mechanical bond close to the bottom of the hole. It was made from cold drawn rod. It has non-loadbearing welds. The Edlerid Gluebolt is similar to the DMM and made from cold drawn rod but the two parts of the shank are swaged to reduce the drill size and to form grooves to provide mechanical bond. The Bolt Products (BP) resin anchors is produced by cold forming cold drawn stainless steel rod. The twisted shank requires a relatively large 16mm hole. It has the appearance of being derived from the DMM and with a casual look might give the impression that it offers increased mechanical bond but it is a complicated matter. With the DMM there is an attempt to place the focus of the mechanical bond close to the bottom of the hole. When the BP anchor is loaded the focus of the mechanical bond occurs at point A where the twists start. Mechanical bond is the interlocking of the anchor with the resin. No commercially available design makes much attempt to place the bond at the bottom of the hole. The cold drawing process produces steel which is work hardened and stressed and has a smooth surface. Cold drawn stainless steel is heat treated at different stages in its production and the finished steel stock is available in various hardnesses. This needs to be considered carefully when choosing the supply of steel stock. The steel's propensity to work harden and its susceptibility to stress cracking is a disadvantage if the steel is intended to be further cold formed. If it is desirable to preserve the structural integrity of the steel any bending should be done after annealing. It is required to comply with the CEN European standard for mountaineering anchors EN959 and the UIAA standard. The diameter of the hole in the rock should be as small as possible. The depth of the hole should be sufficiently deep to reduce the tendency for rock failure. The mechanical bond should occur as near as possible to the bottom of the hole. The inside edges of the eye should have a sufficiently large radius to provide a smooth run for rope. It is desirable to use a type of resin which is legal to be used in any country, is readily available and is likely to be so for the foreseeable future. The resin has to be chemically stable and safe. It has to be suitable for installation in wet conditions. It should be capable of being removed without significant rock damage so that the hole can be re-used. CEN and UIAA standards for rock anchors. The salient points of EN959 are that it has to have a minimum load bearing capacity of 15kN with the load applied axially (straight pull) and 25kN applied radially (shear). It also has to have an eye of specified minimum dimensions. It has to have a specified minimum radius of 10mm on external corners and a minimum radius of 0.2mm on all exposed edges. The type of resin has to be specified. No sample size is specified. The UIAA and the CEN cooperate in producing the standards for mountaineering equipment but for reasons to do with copyright the UIAA have recently increased some of the specifications in their standard. The new UIAA standard for rock anchors has increased the axial load test to 20kN and has introduced an additional test for resistance to rotation on the hole axis. The IC anchor is machined from hot rolled 316 stainless steel plate. The hot rolling process produces steel which is more ductile than cold drawing and it is less susceptible to metal fatigue whilst having sufficiently high tensile strength for our purpose. It was thought that stretching would have a significant effect on the performance of the bond. The first prototypes had equally spaced teeth in order to investigate the effect of stretching at the early stage and inform the design of later prototypes. The equally spaced teeth enabled the stretching to be measured at different points along the length of the shank. Later prototypes were comparatively tested cut with different direction of grain to investigate the effect of the grain direction on stretching and distortion. The IC anchor has gone through a process of development involving the testing of seven prototype designs in 14, 13 and 12mm diameter holes of different depths. In the early stages of development various surface treatments and bonding agents were used but it was found that these had a minor effect on the peak loads. The properties that make stainless steel resistant to corrosion also make it resistant to chemical bonding. The bond between the anchor and the resin is partly mechanical and partly dispersive adhesion. Many things such as expansion and contraction, stretching and creep can reduce the dispersive adhesion and it was concluded that the mechanical bond was uniquely important. It was also determined that it is important to minimize stretching and that it is crucial that the focus of the mechanical bond should be as near to the bottom of the hole as possible. The grain structure of the steel was taken into account and it was determined that it was marginally beneficial for the anchor to be in line with the rolled axis of the sheet which was shown to give slightly less stretching. The early prototypes were pulled out at peak loads above 40kN which was deemed to be too high. It was decided that a peak load in the range 30kN and 35kN was acceptable. This was a figure which was above the 20kN minimum required by the UIAA by a reasonable margin. The dimensions of later prototypes were reduced to give a peak load figure in that range. The dimensions of the drilled hole in the rock has been settled at 12mm x 90mm which requires the removal of roughly 40% of the volume of rock compared to the DMM anchor. Increased metal in the zone marked Z reduces distortion and stretching. The maximum mechanical bond is at point X close to the bottom of the hole. There is an allowance for wear on the dimensions of the eye. It could be worn to half it's thickness and still be much stronger than an average karabiner. Before any wear the eye is immensely strong. Loaded in any direction it is about four times the strength of the average karabiner. The radius on each of the inside edges of the eye is 3mm which is much bigger than the minimum 0.2mm required by EN959 but this radius provides a smooth run for rope passed through the eye. When installed a countersunk groove is created next to the drilled hole to take the bottom edge of the eye and there is a 5mm tolerance on the embedment depth. The bottom edge of the eye can be level with the rock surface or up to 5mm below. The maximum depth is set to comply with EN959 which states that an 11mm and a 15mm circle (representing a karabiner and a rope) must fit through the eye. The IC design also provides for a rope to run freely without touching the rock in order to minimize friction. Through the course of development the dimensions of the hole and the metalwork were determined but in the latter stages the main objective became to achieve the most consistent test results with the lowest deviation from the mean peak load. The next stage of the development process was to test the anchors in limestone.